Food Blogs not only helped to improve my culinary education over the last year, they also have shown me, that I might be missing one important gene: The one that makes you love macarons. While some food bloggers have investigated the holy scene of Pierre Hermé and Ladurée in the past, others were courageous enough to face the challenge and create their own – as far as I can tell from their appearance – very successfully! Perhaps I should think about revisiting Paris (yes, quite a burden…;) and see if there is some hope for me – or if I am doomed to a macaron-less life. 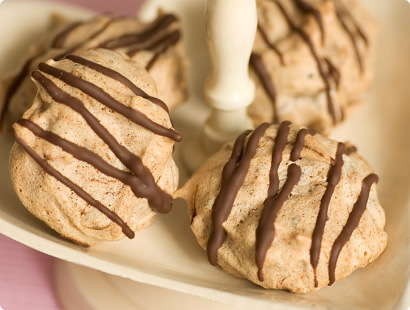 But then I also have my own sort of remedy: A cookie called “wasp’s nests”. Probably the first cookie I prepared together with my mum, balancing on a chair next to her – I was a real shorty back then… This is one of the few memories I have about baking cookies with her, because she was anything but into baking cookies – she hated it and still does. With the egg whites as a basis for the cookie dough (would batter be more adequate? ), I suppose they qualify as macarons. An important difference: They are prepared in no time and their outward appearance is not crucial, no uniform shapes are required! Taste-wise often underrated, because eaten still warm, they simply melt in your mouth and are a delicious treat. A little aged (one to two weeks) their “biting experience” changes, they’ll burst into lots of crumbly, dry chunks when you bite into them. Of course they are still fine (kept in a tin can), it’s just that these are typically the first cookies I make each year, so they usually never pass the 3rd or 4th day. Preheat oven to 200°C (390°F). Evenly cover a lined (parchment paper) baking tray with almonds, sprinkle a teaspoon of sugar over them and toast until golden brown. Turn them once, then remove and let cool down. Now reduce the oven temperature to 160°C (320°F). Beat the egg whites, add the sugar together with the vanilla sugar and continue to beat until the mass forms stiff peaks. Stir in the lemon juice, then set aside. Finely grate the chocolate and carefully fold in with the egg whites and the toasted almonds. Use two teaspoons to help portion the cookies on a lined baking sheet. Bake for about 20 minutes or until lightly golden. Once cooled down, decorate with melted chocolate, if desired. Required time: prep. 15 min., baking time 20-25 min. I love macaroons. Like you, I have noticed a lot of Macaroon entries lately in the food blogs that i read. I only wish that the lat time I was in Paris, I made the effort to try some. They seem to be all over Paris. I can't wait to try your recipe...I think the term you are looking for is slivered, as in slivered almonds. Keep up the great work. Your cookies sound some much easier to bake than macarons. I'll try your recipe this week end and maybe I'll add a little colour to make them look fancy. I became obsessed with macarons too when I move away from France and I've been deprived of their suble taste and texture since then. Not sure if I can find gestiftelt in New Zealand, though. Have a good week end. Hi ! another recepe for macarons ! I'll try it ! there are such a lot of different one, I give 3 differents ways to make them and my recepies are from the famous " Ecole du grand chocolat Valrhona"
You can see them here ! As always, these look good. I love macarons but I have issues with any recipe that starts with "let the eggwhites rest for two days"... Do you know the "luxemburgerli" of the Cafe Sprüngli in Zürich? They have a strict rule that they don't sell them anywhere that takes longer than an hour to transport from the production location. I once persuaded my husband to drive over and spend the weekend in Zurich just because of luxemburgerli. Well, also because of "hiltl", but that's another story. I love the word "gestiftelt", I guess the best word in english would be "slivered", although I also have seen "shredded" and "splitter". But none conveys the same intern meaning to it, don't you think? I'm not very patient when it comes to baking cookies, so your recipe sounds like exactly what I'm looking for during Christms season. As I like my cookies really sweet, I'm probably going to substitute the dark chocolate with milk or even white chocolate. Thanks! Oh, yes! I had a chance to try proper macaroons from Paris and they were so nice! I love the colours, different tastes. I am inspired to make these now. I made macarons/macaroons for the first time this week as well (pistachio ones a la Nigella Lawson) and was very pleased with the result, even if they didn't look so perfect:) The taste was wondeful! I must say that I think I want to spend time at your Aunt Lene's house. I may not be a kid anymore, but I still have a soft spot for warm cookies and baby bunnies. leo.org suggests "julienne" for "gestiftelt". Or "almond slivers" for "gestiftelte Mandeln". There you go. I love those cookies, my Oma makes them every year, so nice to have the recipe. Slivered is the best translation, i beleive, that is how thy are labled in the stores here in the U.S.
mercotte, Thanks for sharing the links to your recipes, how yummy! Dreska, If you make them, shoot me a quick note, I'd love to hear how they turned out! Pille, It's got to be the macaron bug, pretty catchy and hard to get rid of. :) Pistachio macarons sound fabulous, just checked out your post - great minds think alike, don't they? With the little difference, that you made real macarons! Dorothee, Devin, I have looked up different sources and wasn't sure, which one was right. To me slivered is something different, like very thin slices. "Julienne" works, because it's technically the same as vegetable julienne. But hey, I guess you could use any of those almond types. I tested it, it was very delicious!!! I love your blog! I've suprised my friends yesterday with these lovely wasp's nests.Put them in a pretty box and it was a perfect christmas present. I've discovered macarons with Mercotte's recipe, who left you a comment above! I'm now an addict!! It is about to rain today and this sounds like a fun recipe to make and enjoy! I use special dark chocolate for my macaroons, and then eggology eggwhites work wonderfully well too. I make at least a double batch, as these go so quickly! Thanks for the wonderful recipe and stories! mmm...really delicious! tnx for the recipe! hi, this recipe sound delicious... just remember there is a difference between macaron and macaroons. macaroons are a singular biscuit of course texture, macarons are two smooth biscuits sandwiched together. They have similar ingredients but are of different origins.